The number of people on the list increasing is certainly due to not everyone being checked-in. 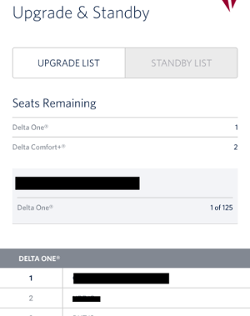 I think the question was maybe more about going from 5 seats available to 0 (although OP did not make clear when those final seats went away -- if it was at the gate, then presumably they were just upgrades). Seat count going down could also be due to SDC to FC from other flights and not all FCM. I usually stop seeing FCM offers when a flight gets down to around F4 or F3. It could be that DL is just picking on me, but I'm not convinced the algorithms are as sophisticated as some here believe. I typically buy cheap X/V fares and used to rarely see FCM offers on those fares prior to May 2017. It's seems pretty clear they tweaked things back then and original booking class doesn't seem to be a factor in when you get them or how much they are charging. KenTarmac, MarkP24 and dmarge18 like this. I imagine that if you look at SEA's big blocks of international departures/arrivals you'd see a correlation between the size of the metal being used (E-175 vs A321) for flights that work nicely with those departures. Given that SLC is already a West Coast hub (in fact, moreso than SEA in terms of routes), most traffic going SLC<->SEA is going to further connect to a select set of destinations - mostly further East destinations or international destinations. Those tend to have certain time of days that those work - hence the change in metal. Compare LAX<->SLC where there are many, many destinations not served in common - those will have a more balanced supply/demand profile for connections (less dependent on, e.g., TPAC departure windows). AntonS and btonkid12345 like this. Wow! That's like half the plane!!! DTW-BWI, A320, I was 13/40 for three seats---thankfully the one empty C+ seat was next to me. And presumably, 125 (okay, a few silvers notwithstanding) boarded during the now-former premium and Sky Priority boarding zones. Crazy. Maybe because of the weather people changed their Detroit-Baltimore flights to a day early, but 13/40 on the upgrade list for Baltimore is pretty bad. If Baltimore consistently has this many origin-and-destination Delta elites on flights then it should have a Sky Club lounge. Back in 2013 and 2014 when I used to fly to/from Washington every week, Baltimore was always an easy upgrade. With no lounge, I always enjoyed getting the upgrade and then having lunch or dinner on the Balitmore–Minneapolis flight. Dulles continues to be easy. Back in 2013 and 2014 when I used to fly to/from Washington every week, Baltimore was always an easy upgrade. With no lounge, I was enjoyed getting the upgrade and having lunch or dinner on the Balitmore–Minneapolis flight. My BWI/ATL routes are about 50/50 the past year or two, but the IAD/ATL routes are just getting harder and harder, which is surprising. I was 20th on the list at one point last year. Everything in and out of Atlanta is difficult. Tend to agree here, unless you fly off-peak days/times. That's certainly when I have the best success.